Achieve Self-Mastery Through Our Comprehensive Style of Shaolin Kempo Kung Fu that develops health, peace, and happiness within. FREE 1 to 1 Private Lessons with an instructor to improve overall skill and understanding. and Shatter Any Goal Faster! in a Healthy and Safe Environment! REACH YOUR GOALS FASTER WITH PRIVATE LESSONS! Most martial arts studios don't teach any private lessons. At Kung Fu For Life you will get the one on one time that will help you achieve your goals and move at the optimal speed for you to get the most out of your training. Each lesson is properly tracked and designed for your maximum achievement. AGES 8 to 80, Any Mental or Physical Condition. Most studios only offer group classes which means you only progress as fast as the group you’re in, with private 1-to-1 instruction costing extra per session. In addition to the accelerated advancement, you’ll also become a much more well-rounded martial artist than those who possess the same belt from a different school thanks to the personalized instruction we provide. Having access to a studio that’s open full time allows our students to have control over their training schedule, whereas most other schools dictate it for you. That extra access allows busy students to find time for their martial arts mastery, and those with more flexible schedules extra time to hone their skills. It also provides those students who need more time to perfect certain techniques the chance to do so in an intimate, stress-free environment through guided practices where an instructor is there to answer questions and help any technique or answer all questions. Learn Kung Fu with the goal of achieving a mastery of both your physical body and mental state of mind by facing stressful situations which we teach you to conquer. Use your new-found fortitude to make your life at home and work more productive and harmonious. Choosing to practice Kung Fu will allow you to get into better physical shape and improve your physical stamina which strengthens the heart and reduces the risk of coronary heart disease. Kung Fu will prepare you to face physical threats and attackers in a calm, relaxed state of mind with a focus on resolving the situation in a peaceful manner. By learning traditional techniques and philosophies, students are enabled to stop the hostility of an attack while viewing the conflict as a chance to turn a dangerous situation into a peaceful one. Our kids programs featuring private lessons are perfect for combatting childhood obesity and instilling confidence in your child. 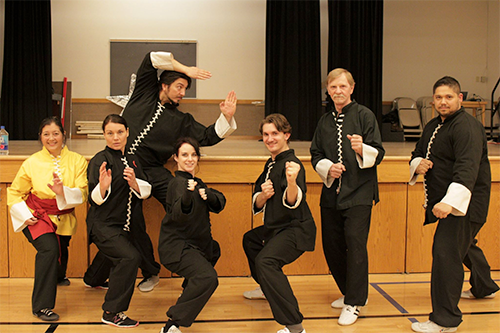 Kung Fu is a great way for kids to develop the discipline they need in school and life. Kids aged 8 and up will learn all types of self-defense, focus, discipline,confidence, perseverance, strength, balance, respect, teamwork, and leadership! With our personalized instruction philosophy you can accelerate your way through our Kung Fu curriculum in a way that suits your current lifestyle. By capitalizing on your strengths and minimizing your weaknesses, our teachers will tailor their instruction to bring out the best in you. Learn Kung Fu with the goal of achieving a mastery of both your physical body and also control of your state of mind. Choose to practice Kung Fu and include training that will allow you to get into better physical shape. Choose to practice Kung Fu while focusing on developing the ability to defend yourself in everyday life. "The Importance Of The Mind (Pt. 3)"
"I have been attending Kung Fu For Life since 2007. This studio provides comprehensive personalized training that allows you to learn at your pace. Nothing but positive results come from this school. Grand Master Piercey and the curriculum that he has set works for any type of person. This is my favourite quality of Kung Fu For Life. It is also the non competitive training, which in turn allows any type of person to come in and feel comfortable. Thank you Kung Fu For life for being awesome."